We today share stories from Barcelona’s Vallcarca. What follows, in translation, is an interview with the anarchist collective Heura Negra of Vallcarca conducted by the Alasbarricadas media collective (02/01/2017). If we do share these stories, it is because of our belief that anarchism must in the end be in the streets. A Las Barricadas (ALB) – Vallcarca is a neighbourhood with a combative history. Can you share some of that history? Vallcarca has been a popular neighbourhood to the north of Gràcia, at the foot of the hill Collserola, with some 18,000 inhabitants, a village within the city. Its low houses, its green spaces and its narrow streets have always propitiated a broad sociability and community. Some of the old folks told us that in Argentera Street and in the surrounding areas there were bars and cafes that were run by anarchists and some night clubs where, they told us, there were prostitutes of the CNT. Though we were never able to confirm these stories. In the first days of the revolution of 36, with Gràcia, it was one of the neighbourhoods that rose up against fascism, with workers as well as small shop keepers and artisans taking up weapons. According to historical sources, the Juventudes Libertarias [Libertarian Youth] had a space here until 1939 and, during the civil war, together with other peripheral neighbourhoods, it was one of the principal centres for the recruitment of anarchist militia. ALB – How did the neighbourhood fill up with okupiers in the decade of 2000? What was the effect of the appearance of politicised people in the neighbourhood? Vallcarca is affected by a modification in the Plan General Metropolitano [General Metropolitan Plan] since 1976. This modification contemplated destroying part of the old neighbourhood and making a road that would connect it with the roads of Collserola. This had as a consequence paralysing everything at the level of construction and rehabilitation of the buildings in the neighbourhood (building permits were not conceded), which then suffered considerable deterioration, accompanied by a complete abandonment on the part of the administration at the urbanistic level. At the end of the 90s, the Ayuntamiento [city council] initiated the first expropriations, provoking a conflict with different neighbours who did not want to leave or who demanded higher indemnifications. All of this was channeled by the association of neighbours. Around what would be the future road, different real estate speculators saw business opportunities and began to buy buildings to then construct the “new neighbourhood”. Or, better, to earn money blackmailing the administration, paying prices for expropriated buildings that would triple in a few years. These expropriations led to the abandonment of many houses, which were slowly okupied. And thus a small okupy movement arose in Vallcarca, that supported the struggle of the neighbourhood against the urban plan. As well, since the beginning of the 90s, the Ateneu [cultural centre] Popular de Vallcarca existed, which was an influential space and a gathering point for politicised youth. In the beginning of the years 2000, the okupying population was noteworthy but, contrary to what could have happened, this factor had a negative effect on the struggle against the urban plan. Many of those who came to okupy had no ties with Vallcarca and, with their arrival, a certain “pull factor” was produced, given that there was a relative permissiveness with okupations at that time. In summary, it was the period of dressing in black, vans, dogs and drugs; a disaster, let’s say. Something that finally accelerated even more the degradation of the neighbourhood and the expulsion of life-long inhabitants. Some of us thought that this process was part of a plan concocted and conceived by the city council, Bagsura (municipal urban management authority) and speculators, before which we didn’t know how to respond. Even so, at that time we created the Plataforma Vecinal [Neighbourhood Platform], where we brought together the more politicised and active okupiers with some neighbours, but in the end we were only 10% of the okupy population and 0.1% of the autochthonous. Despite trying to politically animate the area with different social centres and public activities, the results were few: in 10 years they continued to evict from the houses and tore down almost the whole neighbourhood, until today. ALB – Were there other libertarian or autonomous collectives before Heura Negra [Black Ivy]? What signficance did social centres like the Blokes Fantasma and the Kasa de la Muntanya have for the neighbourhood? Were there other “mythical” okupations like these? As far as we know, since the transition we have not been aware of any libertarian or autonomous group centred in Vallcarca. Some of us knew first hand that in the mid-90s there where already some okupations, but these were above all by persons who were active in the okupy movement or in the Ateneu Llibertari de Gràcia. La Kasa de la Muntanya and Los Blokes were always places to ask for assistance and share resources, but they never implicated themselves with anything of Vallcarca at the level of the neighbourhood, beyond support for a few of the evicted. ALB – How was Heura Negra born? After the okupation movement failure of the period between 2000-2008 in the neighbourhood, Heura Negra was born in the year 2010, coinciding with the new cycle of struggles and the emergence of 15M. The original nucleus began with a few people, organised around a small affinity group that published a few things (Sota el Pont), engaged in graffiti, made posters, and organised neighbourhood information pickets during the general strikes. We believed it necessary to get out of the (ideological) closet and create a public libertarian space to attract part of the new wave of activists born of 15M, a movement with which we always sympathised and collaborated, but for which we did not predict a happy ending. Likewise, we hoped to re-group the old activists of the neighbourhood, to draw libertarian ideas from out of their marginal existence, to engage ourselves in an organised way in local struggles and to provide for ourselves mutual aid, among the members of the assembly. ALB – In this sense, what has been the common activity of Heura Negra? What positions does it assume within anarchism? The activities of Heura have changed since its birth 5 years ago due to the coming and going of many different people with many different interests. In fact, a number of years had to pass before it could could gain roots. In the beginning, we started with campaigns around general themes (against evictions, support for general strikes, anti-repressive solidarity …). Perhaps one of the most significant successes of the first years was the okupation of the garden, a communal space which until today remains very active and which engages a great diversity of people. In the meantime, we endeavoured to animate activities of a libertarian and anti-capitalist nature at the level of Barcelona. With time and after many experiences with mixed results, we came to give priority to work in the very neighbourhood, as we saw that it was locally and in the everyday, in day to day work, where we could be most effective. This was channeled into efforts to centre our energies in promoting self-organisation in Vallcarca, participating in a more active way in the Assembly of Vallcarca and the project of the Pla Popular [a local urban planning], or in recuperating abandoned spaces like the Plaça Farigola (a building lot that is today a self-managed space) or the Fustería (a building semi-demolished by the previous municipal government that we are rehabilitating as a community space). Furthermore, during these years, we have assumed that we are a collective with a public image and we have the intention of projecting ourselves beyond our circles of affinity, as one more reference of organised anarchism in the city of Barcelona. Heura Negra does not have a defined ideological position within anarchism, given that what unites us, basically, is the territorial space (Vallcarca) and the libertarian ideas of its members (in the broadest sense of the term). Despite today being able to work in a more social ambit, in former times the assembly was closer to other currents of thought and modes of action. It has been the people who have participated and their interests that have placed it in the current moment. ALB – What influence did Huera have in the creation of the Assembly of Vallcarca? Are they the same? One is born of the other? They are not at all the same! The Assembly of Vallcarca was born soon after 15M. Yet it always had a particularity all its own compared to the others. The urban theme was always a priority, something that allowed it not to die like the other assemblies indignadas and which today makes it a principal actor in the neighbourhood. Some persons of Heura, other collectives and neighbours, decided to generate this space to work, autonomously and horizontally, on more specific local issues (public space, gentrification, urbanism, …) and not necessarily libertarian ones. 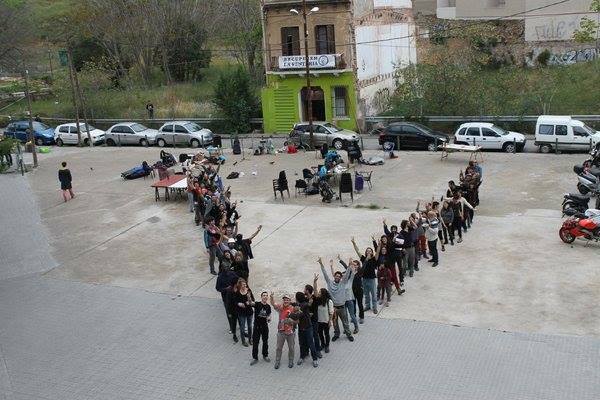 Currently, the Assembly of Vallcarca is made up of diverse collectives and individuals with a common neighbourhood project and with the intention of establishing itself as the principal agent of the neighbourhood, the space where all the political-social activities, with the desire to change the nature of those activities, converge. At Heura, we always sought that the Assembly should be a popular counter-power, that is, instead of being just another assembly of the indignant, that it be a sort of group of neighbours 2.o with a vocation for being a communal and popular institution. However, for that, a great deal of work remains for us to do. Who knows what the future will bring us. One of the initiatives that originates in the very neighbourhood assembly is the new Plataforma Vecinal [Neighbourhood Platform], through which is sought to implicate all those neighbours to whom the name Assembly is not attractive or who cannot commit themselves to a group that operates through weekly meetings. We know that initiatives like the Assembly of Vallcarca continue to have a character that renders it hostile in the eyes of many neighbours, for they associate it with the prejudices generated at the time of the okupations and the degradation of Vallcarca. Accordingly, efforts are made to find strategies to promote the discussion of neighbourhood problems with the greatest participation possible, even though drawing upon means of a more classical form. ALB – In addition to Huera, the neighbourhood of Vallcarca has a great many associations given its size, such as the Assemblea de Joves, the Fusteria, the Ateneu Popular, Esquerra Independentista… Can you tell us a little about these. Today, the Assemblea de Joves [Assembly of Youth] does not exist, it lasted approximately a year, although the vast majority of those involved in it continue to participate in the autonomous and self-managed initiatives of the neighbourhood. The Fustería is a community space that opens with the aim of gathering different social agents under the same roof, and thus create new symbioses. And, maybe, attract more people to the political project of creating a popular [people’s] neighbourhood. To some extent, the Banc Expropiat is our reference. Despite that, we think of it as the Sagrada Familia de Vallcarca, due to all the work that it needed (we did the whole roof anew!). At the same time, our eyes are fill with hope when we see that many people help with the work by the seventh or eighth day. At that stage, any other place would be dead! The Ateneu Popular is a fundamental part of the history of this neighbourhood and we maintain a good relationship with many of its members, at the same time sharing spaces with them such as the neighbourhood festivities and the same Assembly of Vallcarca. A few months ago we learned of the birth of an independentist group in the neighbourhoods of Vallcarca, El Col and La Salut, but we lost track of them. We don’t know if this initiative remains active. Other collectives to bear in mind in Vallcarca (and which we salute warmly) are the Colectivo de arquitectas Volta, the space L’Antic Forn de Vallcarca, the Cooperativa d’Habitatge [housing cooperative], the okupied garden, the CSOA Kasa Nostra, the space La Reina d’África, the Arxiu Històric de Vallcarca, the collective Salut Entre Totes, the CSO Oldschool, la bodega, L’Observatori, La Riera and others that we forget and for which we apologise. ALB – Let’s get to the central question, how can a libertarian collective arrive at having real importance in a territory? The first thing is to do a good analysis of the surroundings, to observe what are the necessities and the conflicts, and to propose solutions and forms of action that are realistic but radical. At some point we realised that in all of the work that we did as an assembly, that that which bore the most fruits was the little, daily work that we did in our own neighbourhood. Instead of dedicating months to the organisation of demonstrations and anarchist campaigns (in which we continue to participate, despite everything), we saw that focusing our efforts in actions as simple as recuperating a building lot and constructing a fountain put us in touch with a multitude of persons and collectives from the neighbourhood, with those with whom later we ended up developing real relations of affinity, mutual aid and resistance. In this sense, we prefer to work on the basis of an affinity and common practices and to set aside identities. In conclusion, we have given priority to political and practical work, rather than debate or internal organisation. However, this has implied many changes in the organisation of the assembly since its beginnings and has generated a series of internal problems that have been costly and difficult to overcome (interminable assemblies, personal frustrations, unfinished projects, overly fixed roles, micro male chauvinisms, etc.). ALB – In summary, what impact does Heura have at the level of the neighbourhood? As we mentioned earlier, the most relevant unifying bond between the persons who make up this collective is territorial. And therefore our basis in terms of impact is Vallcarca. For us, the objective of Heura is to participate as one more collective in the initiatives of the neighbourhood from a libertarian perspective, but understanding that there are more possibilities within the territory and therefore what is of value is to build that Vallcarca that we want from within the transversal spaces in which we participate. It is this direction that we have taken in the last years of Heura, for this was not always understood nor was this line of action always taken; but we have evaluated it very positively. Today, we can say that the network of collectives of Vallcarca is very closely tied to the Assembly of Vallcarca, and, on this basis, we organise ourselves towards our common objectives. For Heura Negra, we believe that this is the way to work from a libertarian perspective, within transversal and horizontal spaces. This networked unity and connection between everyone has made the Assembly of Vallcarca a small headache for the politicians of BcnEnComú [the current “left” government of the city of Barcelona]: recently, they have no longer treat us paternalistically and they have begun to understand that we are serious. We believe that the point of rupture was when we occupied a few floors of a municipal property during the presentation of the Comissió d’Habitatge [Housing Commission]. It is true that this participation can render invisible Heura Negra as a collective, in not seeing a significant volume of work uniquely tied to it, and that its participation occurs within transversal spaces. For this reason, if we were to ask those in the neighbourhood what does the libertarian assembly of Vallcarca do, they probably wouldn’t be able to say. ALB – Tell us about the campaigns and projects that you are currently involved with. At this moment, we give logistical support to the PAICAM, which is the Plataforma de Afectados por el ICAM [The Platform of those affected by the ICAM, the Institu Català d’Avaluacions Médiques/The Catalan Institute for Medical Evaluations, responsible for evaluating work related health and disability claims in Catalonia, which it rejects almost systematically]; we publish, with other collectives from La Salut and Gràcia, the magazine La Metxa (with a satirical section known as L’Escorpi); we participate in the organisation of the Marches Against Prisons of the 31st of December and we organise yearly a First of May event. We usually organise a solidarity gathering [Calçotada] in March that is much liked and we also participate in the libertarian festivities of Vallcarca and Gràcia. The urban issue gives us a great deal of work; we are trying to bring together different demands in the project of the Plan Popular. We thus participate through the Assembly of Vallcarca in an alternative urban plan where efforts are united, for example, to transform a building lot into a housing cooperative ceded according to use, to the demand of the AMPAS [School Parents Association] for a school in the neighbourhood. This is a non-gentrifying and ecological plan, with a more human scale urbanism that takes into account the soul of the people of Vallcarca, among other things. Another of the current campaigns is to keep out, to the degree that it is possible, the speculator Nuñez y Navarro (owner of one quarter of the neighbourhood). It is a project that we proposed and we are seeking commitments. Finally, since its birth a few weeks ago, we are very attentive to the new front that has opened up in the neighbourhood with the Comissió d’Habitatge of the Assembly of Vallcarca, focused on stopping gentrification and struggling against energy poverty and the housing emergency. At the same time, we try to support libertarian initiatives in the city, support comrades victims of retaliation and participate in other spaces and other struggles (there is a great deal of multi-activism). ALB – Many thanks for your answers and much encouragement for the work you doing in the neighbourhood. We hope that it grows stronger. This entry was posted in Interview, News blog and tagged 15M, anarchism, gentrification, revolution, spain. Bookmark the permalink.